Gan Gan Hill is one of the most frequented places in Nelson Bay because of the extraordinary views. There are several lookout platforms that give visitors a chance to see a panoramic view for miles. Guests are able to see from Port Stephens to Hawks Nest giving them exquisite photo opportunities. One stop that most vacationers try out when they come to Nelson Bay is the Nelson Bay Golf Club. There are 27 championship holes to play while watching for native wildlife like kangaroos, koalas, and wallabies. The views from Nelson Bay Golf Club give visitors seascape sights among lush greenery, mountain views, and majestic trees. After a round of golf, there is plenty of delicious food choices at the club bistro to taste and plenty of room to relax in the clubhouse with a glass of wine or champagne. New additions to Nelson Bay Golf Club include handicapped accessibility and a southern platform for even more splendid views than before. Guests can even rent facilities for business meetings, weddings, birthday parties, and charity fundraisers. Dolphin Swim is a must-see destination no matter how many times visitors come to the area. There are very few places in the world where guests can travel alongside wild dolphins. The underwater views and sights are just as breathtaking as watching the dolphins play. Whales can also be seen swimming in Nelson Bay. The staffs at Dolphin Swim are very attentive and offer guests the most exciting sights available in Nelson Bay. Visiting Nelson Bay never gets old. Vacationers frequent the area annually to see the sights and experience the wildlife sightings over and over. No matter whether it is the first time or the tenth time visiting Nelson Bay, guests can expect to see something new. It is the perfect place to schedule some downtime or plan the trip of a lifetime. There are plenty of chances to see the mountains and the sea giving guests beautiful sunrise and sunset photos. The wildlife offer more exciting chances to grab a picture or teach the kids about Australia's wild animals. Guests can spend some time rediscovering each other with a special couple's weekend or take the whole family for the vacation that is out of this world. Nelson Bay is the perfect place to visit year after year. The resort spas give guests a reason to come back for some luxurious pampering and quiet reflection. Are you interested in planning about a trip to Nelson Bay? Do not forget to visit Nelsonbayhotels.au.net for accommodation information or booking needs. We also recommend our top searched accommodation in November 2014: Amore at the Beach Nelson Bay. 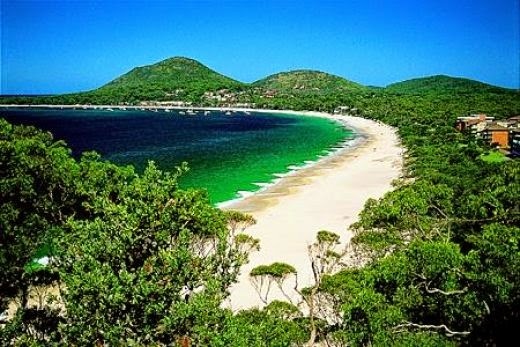 Almost everything you need at Nelson bay is just 5 minutes away from this place.